An evening pause: Performed during a Ringo Starr concert in Japan, 1995. The Russian company that builds Russia’s Proton rocket now faces bankruptcy and reorganization. By the middle of 2018, due to the dramatically slowed down rate of Proton launches, its manufacturers fell deeper into the red and needed federal funding to stay afloat. According to the official numbers, GKNPTs Khrunichev lost 23 billion rubles in 2017 and asked for a 30-billion infusion of cash from the government. At the end of June, the Head of Roskosmos Dmitry Rogozin acknowledged an ongoing effort to fix the financial situation at Khrunichev and announced plans to accelerate the switch of the Russian launch operations from the Proton to the Angara family. Ironically, Roskosmos exacerbated the company’s debt with its penalties for missed production deadlines, even though Russian payloads slated to ride those delayed rockets were themselves years behind schedule and GKNPTs Khrunichev had no room to store large rocket components. In an effort to raise capital, Khrunichev planned to sell a big part of its campus, located in the hyper-valuable real estate area of Moscow, to private developers. In the process, the company would also dramatically reduce its production capacity and cut its personnel in the Russian capital, shifting key manufacturing operations to Omsk, in Western Siberia. In another cost-saving measure, around 200 people were reported to be marked for layoffs at Proton’s launch facilities in Baikonur beginning in the fall of 2018. The Russian government, rather than allow for competition, is working to prop the company up. So, rather than having new companies appear with new and better ideas, Russia will be saddled with an old company not good at innovating. China today launched a remote sensing satellite with its Long March 4B rocket. The satellite is designed to observe the Earth at high resolution, but little else is known about it. China now as a 22 to 20 lead over the U.S. in 2018 launches. An evening pause: As we sit in the depths of the summer, this song about of all things roadkill somehow seems fitting to me. For geeks only! The video below the fold shows the new equipment that SpaceX has developed to retract the open legs of a used Block 5 booster. This video shows them attaching the booster in a secure vertical position, then attaching cables to the base of the first leg which are then used to retract it back into its launch position against the side of the booster. The design is quite clever. The design also shows how primitive the art of reusable rockets remains. Though SpaceX has clearly succeeded in simplifying and automating this process, it remains slow and complex. In time this will get easier, but right now, this remains state of the art. China today successfully launched two more GPS satellites, using its Long March 3B rocket. With this launch China regains its lead over the U.S. in the national rankings, 21 launches to 20. Capitalism in space: It appears that SpaceX is planning to do its first reflight of a used Block 5 booster on August 4. SpaceX is once again demonstrating why they have taken over the global launch industry. They are proving that they will be able to routinely reuse a relatively small number of first stage boosters, frequently, and cheaply. CORRECTION: I initially wrote this post under the mistaken impression that the booster being reflown was going to do so after only fourteen days. This was wrong. The booster was flown two months ago, in May. An evening pause: I know very little about opera, having never been much of a fan, but I must admit that the old woman’s song here is most intriguing, and seems to lay the foundation for a good tale. The Ninth Circuit Court has ruled that a lawsuit by injured Trump supporters against San Jose and seven of its police officers can proceed. A three-judge panel unanimously affirmed U.S. District Judge Lucy Koh of the Northern District of California’s 2017 ruling denying the city of San Jose’s efforts to dismiss the suit against seven police officers. The plaintiffs say the officers channeled them into a violent crowd on June 2, 2016, as they exited a rally for then-presidential candidate Trump at the McEnery Convention Center. Rally-goers say they were punched and pelted with eggs while nearby law enforcement officers did nothing to protect them. The panel also declined to block the 20 plaintiffs’ claims against San Jose, which Koh allowed to stand, saying it lacked jurisdiction to consider that portion of the city’s appeal. Unfortunately, the big fish will get off scott free. The suit originally named San Jose Police Chief Eddie Garcia and Mayor Sam Liccardo. Liccardo was dropped as a defendant from an amended version of the suit in November 2016 and Koh’s ruling dismissed claims against Garcia. They’re coming for you next: When a pro-Trump group decided to gather at the now destroyed star of Donald Trump at the Hollywood Walk of Fame, a mob quickly formed cursing them, then threatening them, then attacking them physically. The video at the link is a little unclear once the fighting starts about who is fighting who. What is clear is that a mob very clearly wanted to shut down a pro-Trump demonstration, and was very eager to use violence to make that happen. This is not the America I grew up in. The idea that someone would attack someone else, merely because of their opinion, was inconceivable in the culture of my youth. And when it did happen, it was quickly condemned, by everyone. Now, such behavior is celebrated. Cool image time! 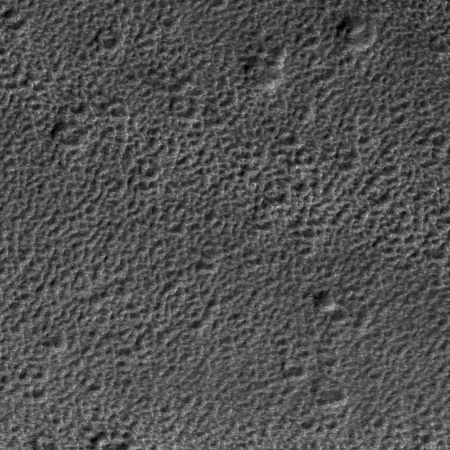 I honestly can’t think of any better term but “vegetable grater” to describe the strange surface in the image on the right, cropped from the full sized image that was released with the July 11, 2018 monthly release of new images from the high resolution camera on Mars Reconnaissance Orbiter (MRO). If you click on the image you can see the whole image, which merely shows more of the same terrain over a wider area. When I cropped it, I literally picked a random 450×450 pixel-sized area, since other than slight variations the entire terrain in the full image is as equally rough. The resolution captures objects as big as five feet across. Looking at the full image there does seem to be flow patterns moving across the middle of the image, but if so these flow patterns had no effect on the surface roughness, other than indicating a very slight difference in the size of the knobs and pits. Overall, very strange. 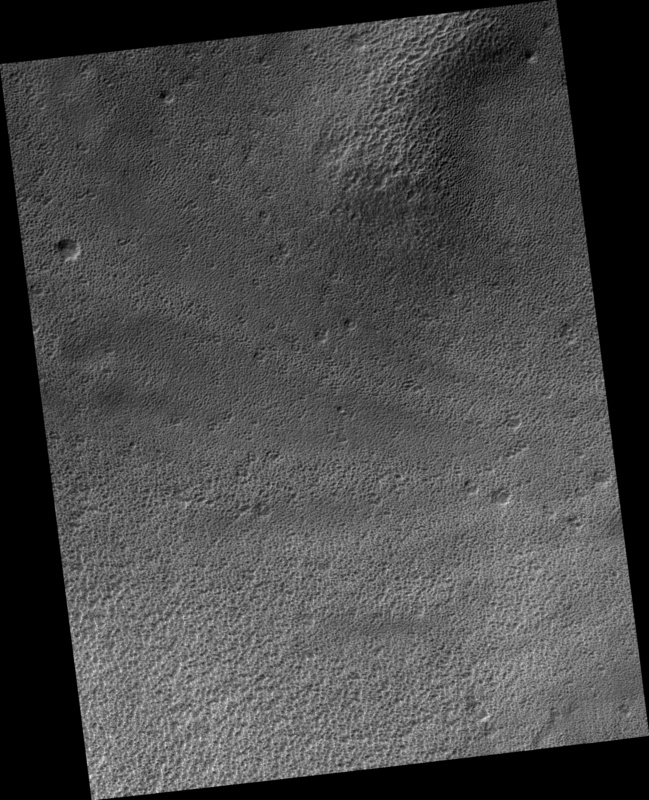 The location of this place on Mars is in the cratered southern highlands, to the southwest of Hellas Basin, as indicated by the black cross in the image below. They’re coming for you next: The report by a Minnesota congressman to the police about a series of threats made against his daughters due to his political positions appears to be part of a rising tide of similar violent threats made against members of Congress, mostly Republicans. Republican Rep. Jason Lewis told Fox News he has contacted the police over threats to him and even his daughters in the wake of reports about controversial statements he made as a radio show host. “It was serious enough for my office to alert the Capitol Police,” Lewis told Fox News. The threats are being made to both sides of the political aisle, though Republicans are getting a larger share. And as long as Democrats continue to coddle and even encourage such behavior, things are only going to get worse, and they themselves are going to find themselves in the cross-hairs as well. It is to their self-interest to calm things down. Sadly, I do not see Democrats doing this. Russian scientists have successfully brought two roundworms back to life after being frozen for almost 42,000 years. Russian scientists said the two prehistoric worms, out of a group of about 300, are moving and eating after they came back to life in a lab at the Institute of Physico-Chemical and Biological Problems of Soil Science in Moscow, the Siberian Times reported. “After being defrosted, the nematodes showed signs of life,” a report from the Russian scientists said, according to the Siberian Times. If confirmed, this result is not only astonishing, it has significant implications, as it suggests that the science fiction idea of freezing people for long interstellar flights might actually be possible, eventually. Link here. He would have been 106 today, and was probably one of the more important, and sadly rare, pro-freedom economists of the 20th century. The link has some excellent videos of Friedman, all worth watching. An evening pause: Performed live in Poland, 2006. Capitalism in space: Virgin Galactic’s Unity spacecraft today successfully completed its third powered test flight, reaching an altitude of 170,800 feet, or about 32 miles. Though this is a record flight for any of Virgin Galactic’s SpaceShipTwos, this elevation is still about half that reached by Blue Origin’s New Shepard suborbital capsule, and is considerably below the presently accepted international definition for space, which is 100 kilometers, or about 62 miles. It is getting close to the line accepted by the U.S. Air Force, 50 miles, and now being pushed by some as a better line for the beginnings of space. Regardless, this success is good news for Virgin Galactic, as it indicates they might finally be getting close to commercial flights, after fourteen years of development. The resolution in Figure 1 is about 3.4 times higher than the images taken from the Home Position [20 kilometers distance] so far. 1 pixel in Figure 1 corresponds to about 60cm. 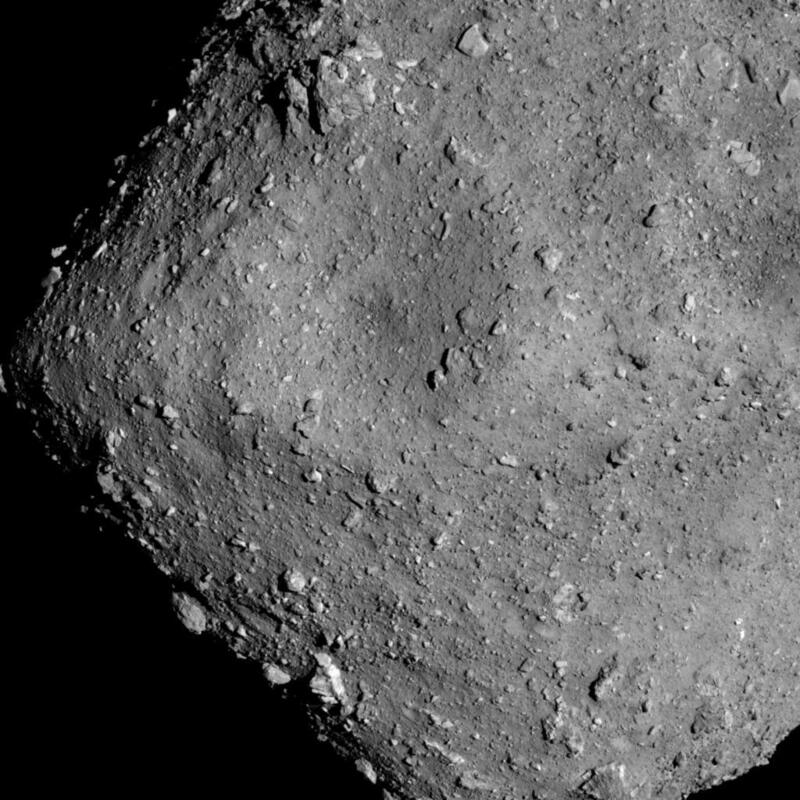 The largest crater on the surface of Ryugu is situated near the center of the image and you can see that it has a shape like a “mortar”. 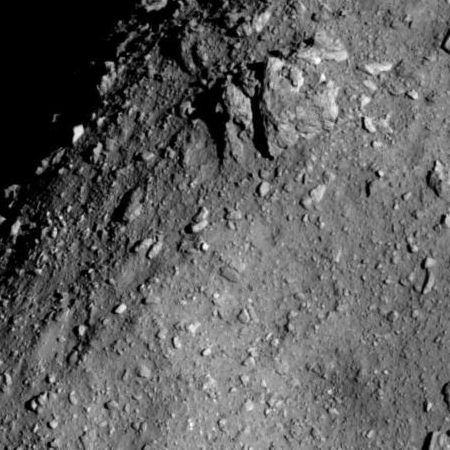 You can also see that the surface of Ryugu is covered with a large number of boulders. This picture will provide important information as we choose the landing site. The smallest objects visible are thus about two feet across.